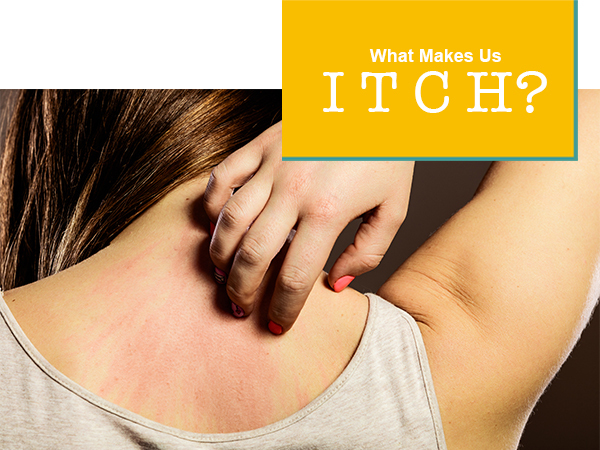 Itchiness is mostly caused by dry skin, allergies, or a skin disorder. More rarely, itchiness can result from prescription medications, thyroid dysfunction, or illnesses like diabetes or cancer. Itchy skin also comes with age, unfortunately: older adults' skin retain less moisture, and menopause can cause itching, as well. Try taking shorter baths and showers in lukewarm (not hot) water. You'll want to wash your skin with a mild cleanser and use a daily moisturizer. Both should be hypoallergenic and fragrance-free. Be careful, though: "unscented" means something different on labels than "fragrance-free," and unscented products might not get the job done. Whatever you do, don't scratch! Scratching an itch just makes it worse and could lead to infection. Soothe your skin with over-the-counter hydrocortisone cream or calamine lotion instead. If your itching has lasted for more than two weeks, is all over your body, is accompanied by other concerning symptoms, or you're just tired of the discomfort, then it's time to see a doctor. An expert dermatologist like the board-certified clinicians at West Dermatology, can prescribe anti-itch medications and uncover any chronic conditions (like eczema) or underlying health issues (like liver disease), so you get relief for good. If you're itching for more information on your skin health, just make an appointment with us.